On this 10th anniversary of 9-11, I have to report that 2011 has been a rough year for Raspberry Ridge. Jim has had four surgeries and the last two were emergencies. All told, Jim has had 9 surgeries and 11 hospital stays since 2006. The gravity of our situation has led me to question whether Raspberry Ridge Bed and Breakfast will come to be. The financial and physical challenges are daunting. I've experienced almost every emotion associated with grief. Denial, Anger, Bargaining, Depression... but never Acceptance that Raspberry Ridge Bed and Breakfast will not come to be. Then today happened. The tenth anniversary of September 11, 2001. I've watched the emotional tributes for all those lost and those that have died since from health related illnesses, the children of 9-11 born with no fathers, women that lost the love of their life, husbands raising children without their mother, firefighters changed forever by what they experienced, and mothers and fathers with no remains of sons and daughters to bury. I also did something remarkable for me. In spite of my terrifying fear of heights and a miserable climb up scaffolding earlier this week, I climbed again. I climbed and stood on the scaffolding with fear but not the paralyzing fear of my first experience. I stood up on the scaffolding and met my fear with a feeling of triumph. I had witnessed greatness and I was inspired to overcome my circumstance. I am in awe how everyday people have soared to hero status by their living example. My heartfelt gratitude for their courage and inspiration has brought me out of my blogging blahs. It's so easy to focus on our struggles in bringing Raspberry Ridge to life. It took a day like no other in American history to bring joy, perseverance, determination and courage back into focus for me. May we never forget 9-11. A vision developed during a lifetime, but where's the mission statement? After years of business consulting in both the public and private sector, you'd think I would know enough to plan our dream by the book. I do but I didn't. First came a dreamscape formulation of "the vision". Childhood brought this destiny of mine first into focus. My recurring dreams would always give way to a common theme. There would be layers of dust over clutter in rooms with floors that could give way with one wrong step, or a roof so sorely in need of repair that I would live a floor down to avoid exposure to the elements. As I grew older, the dreams became more sophisticated. At times, I would dream there was no money for the necessary repairs and so I would live in a partially completed but magically mine world of my creation. I would lovingly layer construction with dreamy hues of paint, wall coverings, and .furnishings. Adulthood brought familiarity to my dreams. I would now stumble upon a house in disrepair but instantly see my future in its potential. I would look past the layers of cobwebs and dust to the treasures hidden beneath. There I would find my destiny - always I would successfully complete my masterpiece. Sparkling rooms with sunshine flooding onto treasures uncovered. Rooms filled with activity and motion, people happily milling about in 'my home'. The dream would always culminate in a bed and breakfast and/or dining fantasy land of satisfaction and achievement. Clearly, the vision for our business plan was set years ago and refined throughout my lifetime. Oddly enough, I am just now getting to the detail of a proper 'mission statement' for Raspberry Ridge Bed and Breakfast. Yes, one would think it should have been completed years ago. Before the hand clearing of our road, local logger harvesting and delivery of dead fall logs from what became officially known as the 4th of July, 1999 Boundary Waters-Canadian Derecho or the "Boundary Waters Blowdown".. 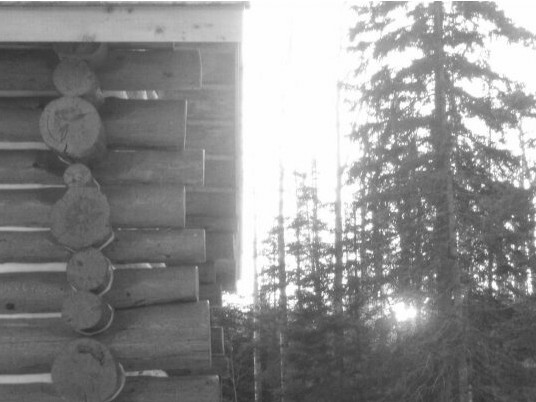 I didn't develop a mission statement before Jim and I started draw knifing those massive red pine logs. The walls went up, the roof completed, the interior floor hung, a room finished and still no mission statement. So tonight I made my first pass at what may or may not be the final mission statement for Raspberry Ridge Bed and Breakfast. "Raspberry Ridge Bed and Breakfast is a destination making a difference. We provide a unique lodging experience by welcoming guests to our handcrafted, eco-friendly log home. Guests experience a return to simple pleasures in Minnesota's majestic North Shore wilderness while being offered organic and local fare, chemically free and refreshing living quarters, and the beauty and serenity of a sustainable, north woods retreat." Never give up... Keep Trying! Keep Trying! My grandsons Ethan and Edison came to stay with Mamaw for 10 days last winter. I said to my oldest daughter Dawn when their visit was confirmed, “Great! Let’s teach the boys determination! !” We definitely want them to be as stubborn and bull headed as we are. Oh yes we do. We definitely do. So, hut two three four, to Mamaw's they came. The boys arrived under the pretense of celebrating a late Christmas due to distance. When at last we were all together again, little two year old Edison defiantly announced “Santa is fake! ….. Santa is FAKE! !” I had already been warned by my daughter Stephany that she felt it important that the boys not become confused about Jesus by believing in Santa. My grandson “Older than five Ethan” knowingly looked on with approval at his little brothers’ assertion. Jim and I later tried to present the snowshoes that Santa had left the boys but it was futile. The bit about Santa being limited to the frigid, winter land of northern Minnesota would have made some inroads with little Edison but not older than five Ethan. He took two steps back and lifted an eyebrow of disapproval that his grandparents would reach such lows as lie to him and his little brother. My daughter Dawn and I looked exasperated at each other knowing it just wasn’t worth sliding further onto this thin ice we found ourselves on. They were frustrated at times, Ethan kept forgetting the placement of the rope both up and down hill. Edison lost patience at all the effort it took to maneuver uphill. Once, he almost stormed away sure I had betrayed him by accelerating his fall to the ground in front of the sleigh. Ethan cut through the Dutch language barrier I was experiencing with Edison’s excited scorn, “He thinks you did it on PURPOSE? !.” That too became a lesson in “Never give up.” I coaxed Edison back to the peak of that hill and with determination he once again committed to have fun on the sled. As I'm writing, the temperature is flashing in the bottom right of my computer screen -18 F. The forecasters called for -35 but in these early morning hours, I think we're escaping that fate. This is cold, even for Minnesotans. Loggers stay home and give their machines over to the frigid temperatures so they can survive to start another day, travelers don't travel to avoid the perilous dangers of extreme cold, parents make sure their children bundle up and wait for the bus inside their own mini Minnesota 'bus shelters', and dogs do their business in a mad dash before the cold penetrates their paws to the point they can't get back inside without help. Yes, it's darn, double darn cold this Minnesota January 2011. These are the days when ski lift operators at Lutsen Ski Resort up the road will look incredulously at down hill and cross country skiers as they keep coming back for more. My husband Jim, worked at Lutsen Ski Resort making snow for a couple of years when we first arrived in northern Minnesota. I had time to do quite a bit of sewing back then so I invested in some Polartec® Windbloc® for Jim's shell pants and pullover insulating layer. I also purchased water repellent material for mittens that came up to his elbows. Patterns in tow, I drove home to a very happy husband. The clothes he had been wearing just weren't keeping him warm. The sewing machine was put to good use that winter. My husband could now comfortably work in night time temperatures of -20 and -30 F while the snow machine pelleted him with freezing water. His gear kept the water out, the warmth in, and my husband the envy of the ski hill. He came home with duplicate orders from his fellow snow makers for more gear like what Jim had please. A true testament to the materials and design of the outerwear. I never was a speedy seamstress so I had to pass on the revenue opportunity but every time we get frigid January temperatures, I remember that winter. Jim couldn't have stayed warm without a well know Minnesota 'secret'. What is this secret you ask? Layers. We have elevated the art of layering clothes to an exact science. It has literally transformed my winter outdoor experiences from misery to awe and wonder at the breathtaking beauty of a Minnesota winter wonderland. The wicking layer. Generally a thin, synthetic material that wicks perspiration away from the skin and helps to protect from the dangers of hypothermia. The insulating layer. There is really only one material for our family - fleece. The day fleece was invented was the day our wool went to the back of the closet. The shell. This is the windproof but not totally waterproof layer. The shell stops most of the wind from penetrating your defenses and yet perspiration and moisture from your body is allowed to escape. In Jim's extreme snowmaking gear, an insulating layer of fleece pants was followed by pants of the Polartec® Windbloc®. Gloves, neck gators, and fleece lined wool cap. Gotta have mits that go up to your elbows for extreme cold. Fleece neck gators (tubes) protect your neck and lower face while a fleece lined cap that ties under the chin can be worn under the hood of your shell layer. Footwear. Mukluks. Will Steger's wife sent him to the North Pole with mukluks for a very good reason. They wick away moisture, while keeping wind and cold out. We can walk in and out from cold to heat in comfort and our feet stay comfortable. For Jim's extreme snow making gear, he used rubberized, insulated winter boots. 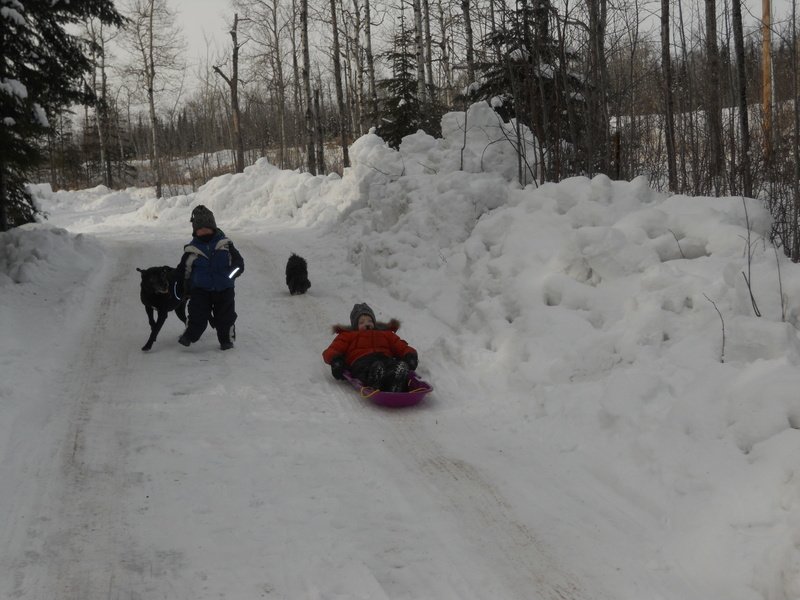 We had so much fun sharing the well known Minnesota 'secret' with our young grandsons last winter. They went from misery to awe and wonder at the breathtaking beauty of a Minnesota winter wonderland. 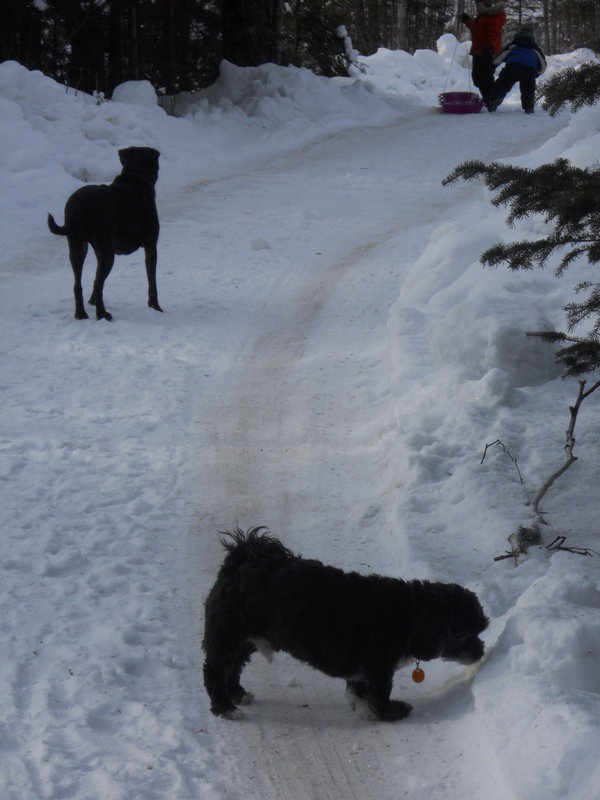 Ethan and Edison are now surviving and thriving in a Minnesota cold snap. Progress and What a Happy Event! We are currently in the middle of nesting in our 95% complete bedroom on the first floor. There is very little to say about such a spectacular event really. The fact that we're sleeping in a roomy, organized living space free of construction materials, the grinding and sanding dust, and war zone like feel of living in a bombed out shelter. Well.. you get the idea. All that is but a memory now as I collect my storage organizers and get ready to bring my wardrobe back from storage. I've been living with a couple of outfits that I can go into public with. The few clothes I've kept have been dedicated work clothes. I am getting geared up for my next big push to finish grinding and sanding our future kitchen. Jim is finishing up the chinking, trim work and electrical in the bedroom closet in between wood runs to stoke the home fires. This La Niña winter in northern Minnesota has been more 'dramatic' than most we hardy types are used to. I'll save the war stories of science experiments conducted on the logs for another post. Let's just say, it was a learning experience and working with dead fall logs where no living tree was harmed is different than using newly felled trees used by most log home builders. Life is grand this week! I'm getting ready for a long winter's nap in our warm, clean, newly finished bedroom. Sweet dreams from Raspberry Ridge Bed and Breakfast. Lights out. Dreams can come true. I have had a recurring dream since I was a small girl growing up in northwestern Missouri. In the dream I always see a home that I know has all kinds of potential but it is in some state of disrepair. Sometimes I walk in and there is dust and dirt 6 inches thick on clutter everywhere I look. Other dream versions have me fixing up old, historical homes as I uncover fascinating antiques and history of the people that had lived there before. Always, I transform the dirty, dusty, run down home into a sparkling bed and breakfast or restaurant. You might say this bed and breakfast is truly my destiny and a very spiritual journey for me. What will it really be like? This home I am destined to create? Raspberry Ridge will have a historic feeling. There will be oiled log walls, handmade cabinetry and rock work using native rocks and pebbles from Lake Superior and our surrounding area. There will be honed slate tile and warm red pine floors with handmade floorclothes throughout. Some plaster walls with be painted with homemade milkpaint and stencils honoring our early colonial beginnings as a nation. Guests will have four bedrooms and two baths to choose from upstairs. Three of the bedrooms will have fireplaces and all will have mature balsam, aspen and birch forest just outside their window. In spring and early summer guests can hear the Beaver River rushing as it cascades in it's descent toward Lake Superior. There will be handmade quilts on the beds, tea and homemade treats in the afternoon and evenings by the fire outdoors, in the living room or privately as guests retire. Mornings at Raspberry Ridge will start by coming down a wooden staircase into the dining room to a community breakfast of local and seasonal, organic fare. Guests will be seated at a long, hand made dining table modeled after a 17th century table used by our forefathers and an artisan made wooden chandelier fashioned of the same period will offer a warm glow. The family style breakfast of hot coffee and tea, fresh and homemade fare will be served up as each guest passes to the next and we make sure there is enough for everyone. After breakfast, guests can hike down the path through towering old growth aspen and balsam forest to enjoy the peaceful solitude of the rushing river. In the winter, guests can enjoy snowshoeing the mile trek down the Beaver River to Glenn Avon Falls. The Superior Hiking Trail is across the river and Fault Line Ridge with it's blueberries and spectacular views of Lake Superior can be accessed just two miles away. Backpacker Magazine voted it as one of the ten best hikes in America and we're proud to live along some of the most beautiful vistas of the trail. There is so much to do and see along scenic Highway 61 that stretches from Duluth, MN to Thunder Bay, Ontario, Canada. We've added links of "Local Attractions" on the blog so take a look around. There is biking, kayaking, canoeing, snowmobiling, down hill and cross country skiing, snowshoeing, hiking, swimming, boating, fishing, shopping, unique restaurants, waterfalls, Lake Superior, abundant, clear lakes, rivers and the beautful seasons of the Sawtooth Mountains. You can view some images of the North Shore at http://jndphotography.weebly.com/ . Raspberry Ridge is the place of my dreams - of our dreams. Now, there is much work to be done as this dream has always been about the satisfaction of hard work and the fruits that come from our labor.